Are you a Ford fan? Chances are you have nothing on Angelo Paletta. From near Ontario, Canada, Paletta has amassed a fascinating collection of Ford’s finest performance vehicles. He’s the registered owner of FOUR Ford GTs, plus a couple of special-edition Mustangs and low-mileage Shelby Cobras. 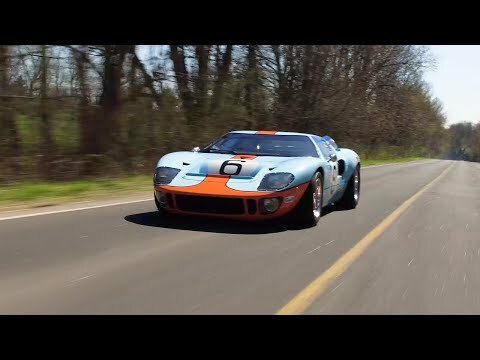 One of those Ford GTs is in absolutely pristine condition. The odometer shows just 29 miles, and Paletta says it’s never left his driveway. It even still has the protective plastic sheeting on the seats and the original factory stickers on the windscreen. It’s a collector’s item, for sure, and one day it’ll probably break an auction record. If you think that cars are built to be driven, and not kept away in the garage, you might prefer the white one. It’s the first one he bought, and the one he uses as his ‘daily driver’. Can you imagine turning up to the supermarket in one of these? If you and Paletta attend the same event, you’re probably going to see this one. When Carroll Shelby – a true icon of Ford’s history – passed away, the car was used to honour him. Shelby signed the centre console of the car, plus the dashboard of one of Paletta’s Cobras. This 2001 model is the third-ever sold in Canada, and features a combination of state-of-the-art racing technology and touches from the 1960s Cobras, including the wooden steering wheel. The other Cobra is another car that hasn’t often seen the light of day. Its 7.0-litre engine is all-original, but it’s only covered 200 miles in its lifetime. The bodywork is made from hand-rolled aluminium. Paletta calls his collection the ‘car cathedral’, and it really is a shrine to Ford Performance. Upstairs, he has a 50s-style American diner and a huge array of memorabilia. But this isn’t a typical collector’s garage. The place is open to the public, like a mini-museum, and used for charity events, get-togethers and BBQs. “I have no other real passions,” he says. “No boats, no cottages, no bikes – cars are it.